Evergreen Packaging has introduced new Sentinel renewable ice cream board, as part of its efforts to offer more renewable product options to the customers. It will be offered as part of the Sentinel paper and paperboard line, and will use sugarcane-based polyethylene supplied by Braskem. The company has designed the new renewable ice cream board to be used in retail food packaging applications. Evergreen is developing advanced fiber-based products to help customers meet their business goals and sustainability preferences of consumers. Other products from the company include Sentinel food service board and cupstock, Sentinel food grade packaging board, and Sentinel flexible packaging paper. These products can be used in a range of food service and food packaging application, including cups, trays, plates, ovenable board, cartons, flexible packaging and box liners. In addition, the products can be used in a wide range of other formats. 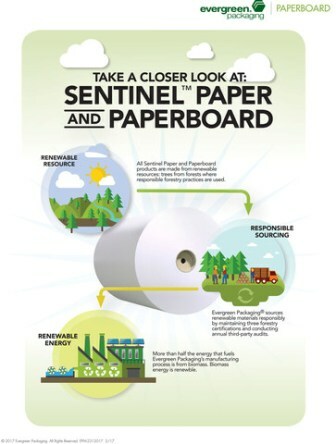 Image: Evergreen Packaging has launched new Sentinel renewable ice cream board. Photo: courtesy of PRNewsFoto / Evergreen Packaging.